Literally. 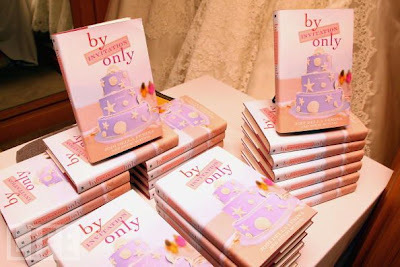 Go to your library (if you're on good terms with them) and check out By Invitation Only by Jodi Della Famina and Sheri McInnis. I'm currently reading this when we go to the Y in the evenings. Hopefully I'll have it done by Sunday, because that's when it's due and I've already renewed it as many times as I can (not because it's a slow read, but because I was slow in starting it). This would make a perfect book for me to take for our cruise at the end of the month. But, unfortunately, it'll be back in the hands of the library by that point. While I'm stuck reading something else, you should give it a try. And by "you" I mean "you" if you are a girl. Still not convinced to read it? Maybe this will help. The book has 101 chapters. Ok. It has 101 chapters and is just 360 pages long. I get a huge sense of accomplishment when I complete a chapter every 50-75 seconds. Each chapter is like finishing the books of Philemon, 3 John or Jude. Now will you go check it out?